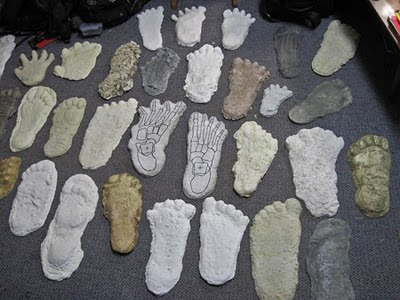 My footprint cast collection is large in both specimen size and quantity. Storage tends to be a problem, and I do not usually bring out the collection for show and tell simply because of the number of casts and the space they'd take up. While working on another bigfoot project recently, I had the opportunity to unpack four boxes of casts and take some photos. I dug around and found another four or five casts just lying around my home, and honestly, I'm not quite sure where some others have gone. Still, the bulk of my collection was laid out before my comparatively small feet, which is a rare occurrence. I thought you'd like to see what this looked like. Welcome to my bigfooty world. How many casts can you identify? Hi Cliff, I am a big fan! After looking at those casts I noticed something odd. There are two track casts there that have opposable big toes. I recognize one as the Coleman Nape footprint reconstruction, but what is the other? 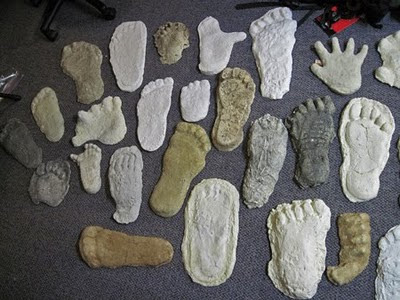 Do you think these prints hint at a valid unknown primate other than Sasquatch? Thanks and have a nice day. One of those casts is from a gorilla in a zoo, and the other is a sculpted cast of something Loren Coleman ran across a couple decades ago in the Midwest. I don't recall the details about it, but it's a singular event and therefore an anomaly that is not representative of the bigfoot species.